Who Invented the Street Sweeper Truck? We can thank Charles Brooks of Newark, New Jersey for the street sweeper trucks that he patented on March 17, 1896. He also patented a ticket punch design that would collect the chads rather than let them litter the ground. No biographical information can be found on him other than that he was a black man. Street sweeping was often a manual labor job in Brooks' time. Keep in mind that horses and oxen were the main means of main transportation and where there is livestock, there is manure. So rather than stray litter as you might see today in the street, there were piles of manure that needed to be frequently removed regularly. In addition, garbage and the contents of chamber pots might end up in the gutter. The task of street sweeping was not carried out by mechanical equipment, but rather workers who roamed the street sweeping garbage up with a broom into a receptacle. It was the old fashioned way but it took a lot of labor, although it provided employment. 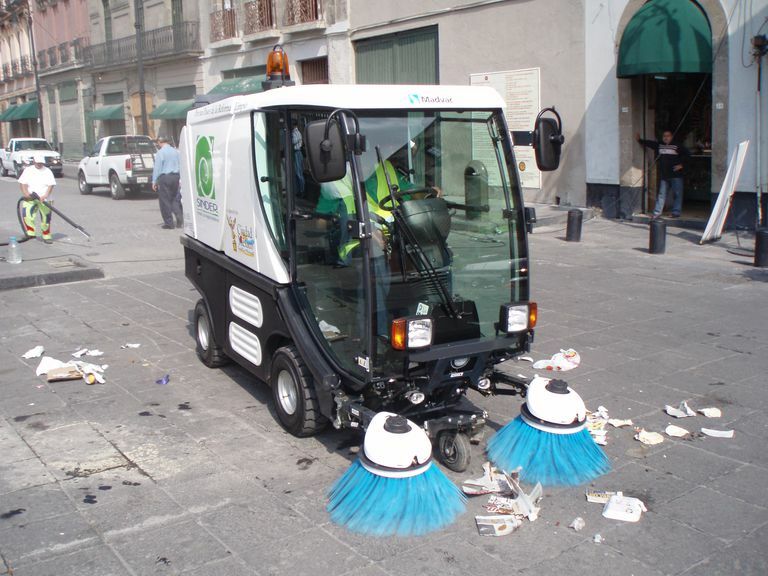 That changed some when mechanical street sweepers were invented by Joseph Whitworth in England C.S. Bishop in the United States. They were still drawn by horses as Bishop's design was towed behind a horse. The improved design from Brooks was a truck with revolving brushes that swept the debris to a hopper. His truck had revolving brushes attached to the front fender and the brushes were interchangeable with scrapers that could be used in winter for snow removal. Brooks also designed an improved refuse receptacle for storing the collected garbage and litter as well as a wheel drive for the automatic turning of the brushes and for powering a lifting mechanism for the scrapers. It's not known whether his design was manufactured and marketed or whether he profited from it. The patent number 556,711 was issued on March 17, 1896. The motor driven pickup street sweeper was later developed by John M. Murphy for the Elgin Sweeper Company, which debuted in 1913. Brooks also patented an early version of the paper punch, also called a ticket punch. It was a ticket punch that had a built-in receptacle on one of the jaws to collect the round pieces of waste paper and prevent littering. The design will look very familiar to anyone who has used a scissors-like single hole punch. The patent Number 507,672 was issued on October 31, 1893. Ticket punches had existed before Brooks received his patent. As he says in the patent, "The operation and construction of this form of punch are well known and require no detailed description." His improvement was the receptacle in the jaw that would collect the punched-out chads of paper. The removable receptacle had an aperture that was perfectly sized so the paper chad would enter the receptacle before being emptied into the trash when full. According to the patent says, "The clippings from the tickets are prevented from flying over the floor and furniture of the car." If anything, it was one less annoying source of litter for the sweepers to deal with. There is no record of whether his invention was manufactured or marketed, but the chad-collecting receptacle is commonly seen on ticket punches today. Who Built the First 3D Printer? Who Invented the Fountain Pen?